My name is Situ Roy. My sister-in-law, Ranjana Roy is only 42 years old, and was recently diagnosed with Papillary Carcinoma of Thyroid (Bethesda Class VI). This means that the cancer has spread beyond the thyroid gland. Ranjana lives with my brother and her son in Silchar, Assam, while I live in Visakhapatnam, Andhra Pradesh. She has already undergone 3 major surgeries, and the doctor expects there will be more to go in the future. Since the medical facilities in Silchar, Assam were lacking, she has been shifted to a hospital in Shillong, which is 12 hours away from their home. My brother works in the hotel industry where his pay is less than Rs 7,000 a month. For the last few months, I have been transferring money to them from Vishakhapatnam to Silchar. The family is financially quite weak, and are finding it impossible to manage the hospital and medical expenses for her treatment. 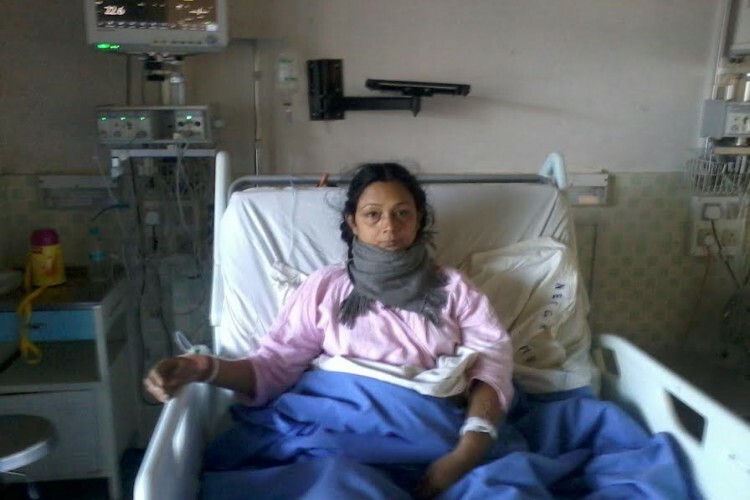 Besides the medical treatment expenses, they also have the expenses of living in Shillong while Ranjana is in hospital. So far, I have somehow been able to help them financially, but unfortunately, the doctor has estimated an overall expense of 1 Lakh 40 thousand, over the course of the remaining surgeries. My sister-in-law, has looked after me as her own, when I was a child. Now it is my duty to do everything in my power to get her the help she needs to fight this fatal disease. I humbly request you to help us raise the money so that she can have the surgeries she needs, and get proper medical attention. You can make a direct donation. You can even share this campaign on Facebook, Twitter, LinkedIn, and Google+, so that this campaign reaches as many people as possible. The faster we are able to raise money, the faster we will be able to save her life. Please donate and share now! Help me save her life. Your share could be as good as a donation for Ranjana Roy! Not everyone can afford to take care of their loved ones. Ranjana Roy's life can only be saved by donations made by kind people like you.